I wish this artist has done more work. I look at this painting and my eyes just don’t know where to stop, there are so many things of which to make note. Isn’t this a kitchen we all wish we had tucked away behind our real house. I was caught by his tied shoes and his breeches being tied at the knee, also his lack of neck-wear. Is that a greatcoat that he wore to work this morning hanging on the wall behind him? I like the elevated cook surface that we can see in the background by the large open hearth. And don’t forget the kitchen cat! Detail: Produce, onions, lettuce, carrots, washtub, pitcher, chair, ladle, bench, cat, brass kettle, basket, fowl, rabbit, case bottle, wall nook, great coat, bird cage, glass bottle, meat, S-hooks, pottle basket,milk pans, bowls, spit rack, tankard, candle box, hearth, crane, stool, table, cloth cap, sleeved waistcoat, apron, breeches, shoes, cat. 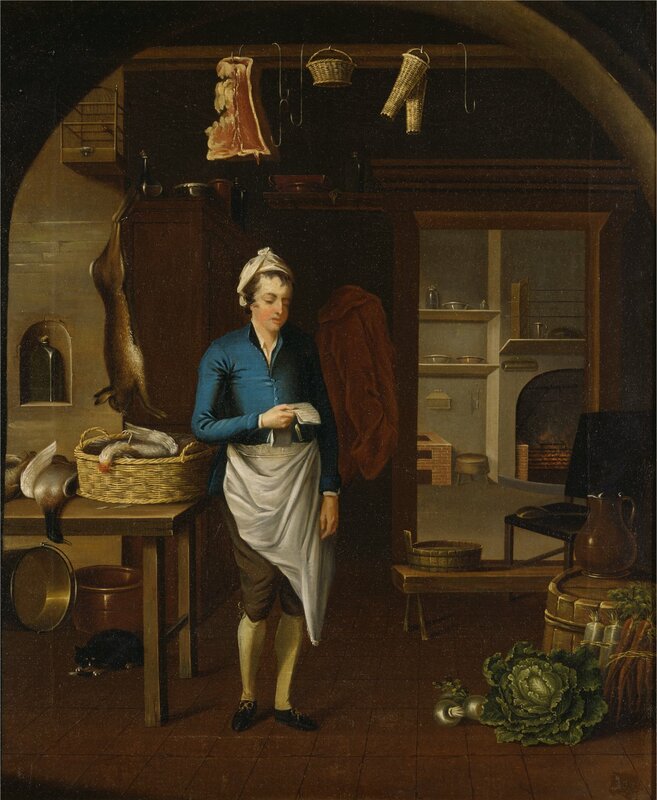 This is not the first time I’ve seen depicted in a period painting a birdcage mounted high in a kitchen. Anyone have an idea why they were there??? This seems to be very common, particularly in English kitchen scenes. I think it may have been a holding area for a bird that lays small eggs which were used in individual pork pies (meat pies). A boiled egg (such as a robin or quail egg) would be inserted into the center of the pork filling before baking. The birds I have observed in these paintings all seem to be small game birds and may have been kept in the cages to make it easier to harvest the eggs and to keep male birds from fertilizing them. They would have been mounted high to keep the cats away! maybe to monitor air condition? Birds are extremely sensitive to changes in air quality. Been thinking about the birdcage post – in the latest painting posted, A Girl Bundling Asparagus, there is a birdcage hung high as well, although in this painting the door is open and the bird is perched elsewhere. Could keeping caged birds in the kitchen have been for insect control? At least for flies and spiders?